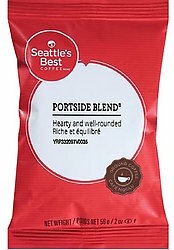 Seattle's Portside L3 Blend Office Coffee. This coffee has all of the attributes of a Seattle's Best Coffee. Fine grind, perfect roast. The quality is consistently incredible. 18 Individually sealed packages. 2.0 oz of wonderful Seattle's Best L3t Blend coffee per package.